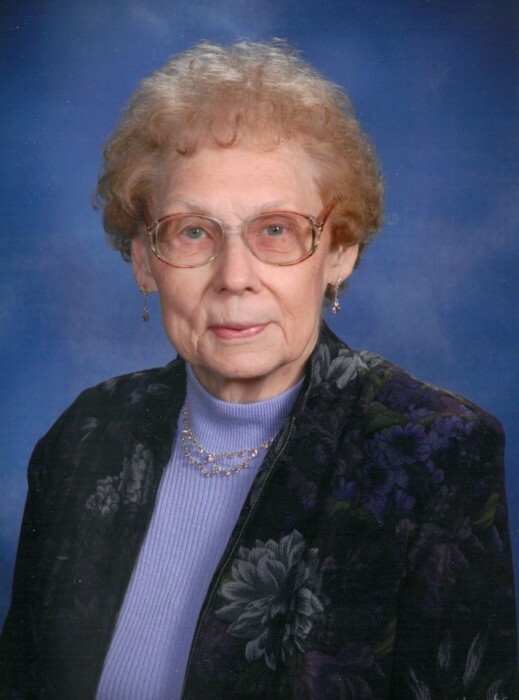 Sylvia J. Olson, age 89, of Parkers Prairie, died Sunday, January 27, 2019, at Edgewood in Alexandria. A funeral service will be held at 11 a.m., Saturday, February 9, 2019, at First Evangelical Lutheran Church in Parkers Prairie with Rev. Rachel Stout officiating. Music is provided by organist, Pam Wenzel and vocalists, Mitch and Tammy Gjersvik. Burial will take place at Elmo Lutheran Church in rural Parkers Prairie. A visitation will take place two hours prior to the service at the church. Sylvia Joy Iverson was born on January 24, 1930, to Sheldon and Hazel (Horner) Iverson in Inman Township, rural Deer Creek. She was baptized on March 22, 1942, and confirmed on October 18, 1942, at Elmo Lutheran Church. She graduated from Parkers Prairie High School in 1948. Following her education, she was united in marriage to Clayton L. Olson on July 4, 1948, at Elmo Lutheran Church. Following their marriage, they lived in rural Parkers Prairie until moving into town in 1956. Sylvia worked as an office assistant for Prairie Pine Mutual Insurance Company in Parkers Prairie from 1969 until her retirement on December 31, 1999. Her husband Clayton died on August 4, 1999. Sylvia was a member of First Evangelical Lutheran Church where she sang in the choir and in a sextet. She was also active in the Bible Study Circle Group. Sylvia enjoyed reading, embroidery, crocheting, sewing and was an avid Minnesota Twins Fan. She was preceded in death by her parents; husband, Clayton; son-in-law, Bob Montbriand; brother-in-law, Michael Brygger; and brother, Roger Iverson. Sylvia is survived by her two daughters, Cynthia “Cindy” Montbriand of Alexandria and Delaine “Dee” (Dennis) Jipson of Dumont; brother, Willard “Bill” (Irene) Iverson of Alexandria; sister, Gloria Iverson of Alexandria; sister-in-law, Sue Iverson of Willmar; three grandchildren, Alicia (Jesse) Jefferson of Fridley, Kelli Montriand of Minneapolis and Anthony Satran of Fargo, North Dakota; five step-grandchildren, Amy Jipson, Derek Jipson, Adam (Sherry) Jipson, Rachel (Lee) Nelson, and Andrew (Kendra) Jipson; aunt, Violet Lien of Moorhead; uncle, Morgan Horner of the Twin Cities; along with several nieces and nephews. Pallbearers are Tim Iverson, Troy Iverson, Todd Iverson, Anthony Satran, Mitch Gjersvik and Brian Hinrichs.